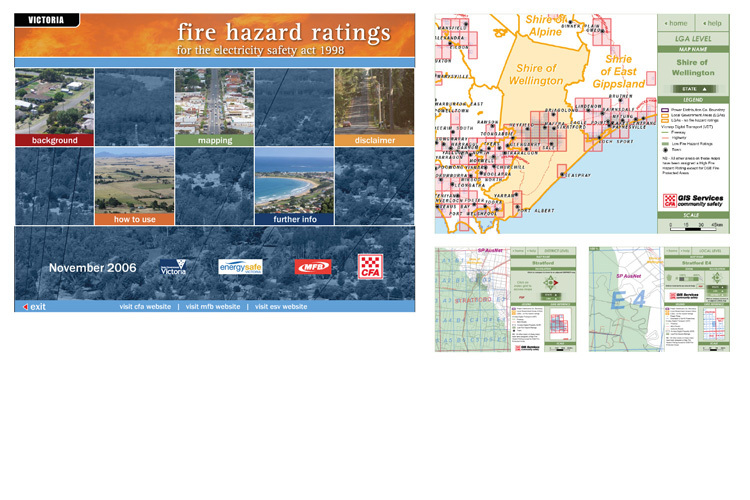 Purpose: Fire Hazard Ratings DVD produced for the GIS (Geographical Information Services) Department of the CFA from 2006-2011. The Fire Hazard Ratings DVD was used by firefighters to determine which areas of the state had low or high fire hazard ratings. The DVD had 4 levels of maps to click on starting from state down to 10k. Every map had zoom and pan functionality with an accompanying pdf. Containing over 4500 maps, this was originally produced in 2005 using flash and XML, with actionscript used entirely for the navigation. © 2019 SIMON BERTOLI All Rights Reserved.